This article is a short summary of Luigi's Mansion: Dark Moon. Luigi's Mansion: Dark Moon (Luigi's Mansion 2 in most regions outside North America) is the follow-up to the Nintendo GameCube title Luigi's Mansion, released for Nintendo 3DS in 2013. Developed by Next Level Games, the game originally debuted at E3 2011 under the title Luigi's Mansion 2, and was set to be released during the holiday season of 2012 before being delayed to the first half of 2013 The game was released as part of the Year of Luigi, a celebration of 30 years since Luigi's debut in Mario Bros.
Can Luigi summon the courage to save Evershade Valley? Explore haunted mansions full of spooky specters and bone-chilling challenges. Catch ghosts and uncover secrets using new gadgets, such as the Poltergust 5000, the Dark-Light Device, and more. Team up with friends and other players worldwide in online multiplayer. (Additional systems and copies of the game required for online play). 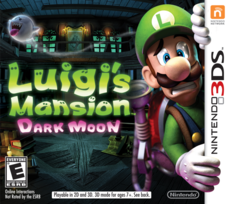 Luigi's Mansion™: Dark Moon is the brand new Luigi's Mansion title on the Nintendo 3DS™ system. This time there are multiple mansions each with unique puzzles and ghosts. Using a vacuum-like machine called the "Poltergust 5000," Luigi™ must explore and hunt ghosts in these mansions to complete specific missions for the great ghost researcher Professor E. Gadd. But shining the flashlight is no longer enough. Luigi must activate the new strobe function at just the right moment to stun the ghosts first, then catch them using the Poltergust 5000. Each mansion is filled with different gimmicks and puzzle elements, and exploring them can be a spooky challenge. In Evershade Valley, Professor E. Gadd is busy researching with his ghost assistants when King Boo shows up and destroys the Dark Moon, the artifact that keeps the ghosts peaceful. Once they start wreaking havoc, the professor escapes and contacts Luigi, bringing him to his bunker, the valley also being covered in fog. Since the pieces have scattered all over the valley, Luigi must now go to each of the mansions and obtain the pieces of the Dark Moon in order to return Evershade Valley to normal. While the basic gameplay has been carried over into this game, various new elements have been added. Luigi must use his Poltergust 5000 to capture the ghosts that have gone wild, though now Luigi must charge the new Strobulb in order to stun them. While the method to capture the ghosts is mostly the same, the player must press the A button after tugging on them enough to pull them in, and Luigi can now press B to dodge oncoming attacks. Normally, the B button is used for running, and the X button is used to look up. At the beginning of the game Luigi receives the Dual Scream, a device that acts as the HUD during missions and allows E. Gadd to communicated with Luigi. The health system remains the same, though now Luigi can obtain continues in the form of gold dog bones, which cause a Polterpup to revive Luigi if he loses all of his health. Dark Moon has Luigi traveling through five mansions, with a mission-based progression system. Each time the player clears a mission in a mansion, the next mission opens up. Each mansion also contains a Boo, which when captured unlocks a bonus mission. At the end of every mission, Luigi is graded based upon the number of ghosts captured, and the amount of gold collected. In addition to the main game, from the bunker HUD players can access E. Gadd's vault to view their stats and ghosts collected as well as upgrade the Poltergust. Players are also able to access ScareScraper, the game's multiplayer mode in which up to four players must clear a certain number of floors by catching progressively more difficult ghosts. ↑ Luigi's Mansion: Dark Moon Delayed to 2013. IGN (August 13, 2012). Retrieved December 27, 2015. This page was last edited on 31 October 2018, at 02:11.